Chemical Reaction: Anthony Begley’s “Chemical Warfare” Funny Car Explodes At Perth Motorplex! 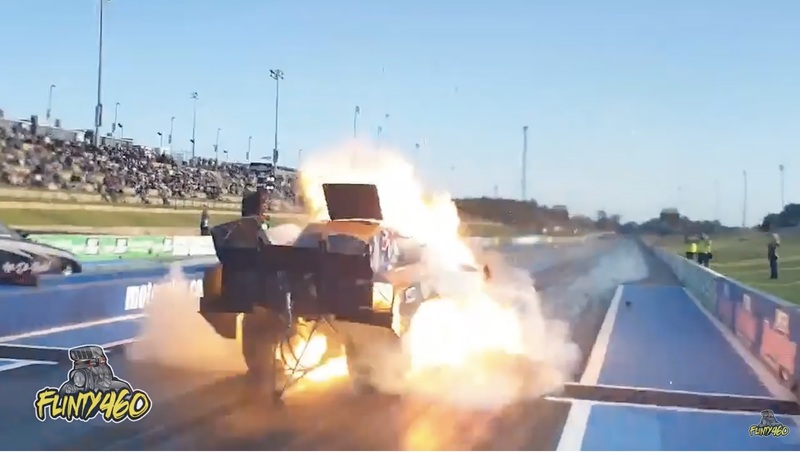 In what many are calling one of the wildest Funny Car matchups they’ve seen in Australia in quite some time, two drivers both went up in bomb blasts during the same run at the “Nitro Night” at Perth Motorplex in Western Australia. In the right lane was Anthony Begley in the “Chemical Warfare” Nitro Funny Car, and in the left was Matt Abel in the “Fun-Da-Mental” flopper. The burnouts went well enough, but when the lights dropped, Begley’s car exploded like a bomb blast, turning the Monte Carlo body into shreds of it’s former self in a fireball that went nearly the width of the lane. A couple of seconds later, further down the track, Abel’s car blew the supercharger and sent the body sky-high as well. When anything nitro powered goes, it goes big and it goes loud. Neither team was able to return to the starting line to finish off the event. So long as the driver walks away from the incident, however, it’s still a positive thing. The car can be rebuilt, the body can be replaced. And you know that someone’s grandkids will have one hell of a show and tell story to show their classmates later on down the road!